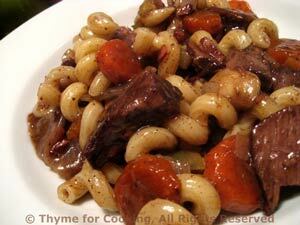 Thyme for Cooking's Main Courses: Greek Shrimp Pasta, Braised Beef. Shrimp with a Greek flavor: with tomatoes, dry or salt-cured black olives and finished with Feta cheese. The feta I get is sheep's milk (brebis - traditional) and comes in 7oz (200gr) blocks. 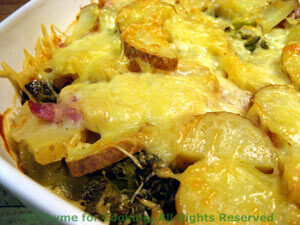 Add it at the end so it stays in chunks, rather then melting into the sauce. Chop shallots and mince garlic. Open tomatoes, drain, reserving juices. Roughly chop tomatoes. To finish: Put drained pasta in a large bowl. Spoon some of the sauce over the pasta and toss to coat. 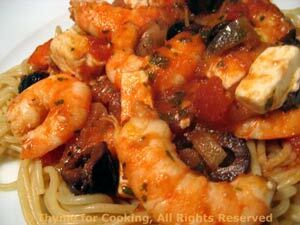 Spoon the rest of the sauce and shrimp on top of the pasta, sprinkle with feta cubes and serve. Sautéed mushrooms and onions round-out the leftover beef and carrots. Serve over pasta for an easy one-dish dinner. Cut onion in half, then in half again. Slice onion (you'll have quarter circle slices). Peel and slice carrots if using. Add onions and sauté 5 minutes longer. 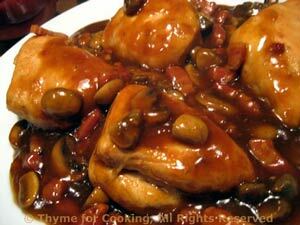 Add garlic and mushrooms and sauté until lightly browned, about 7 minutes longer. 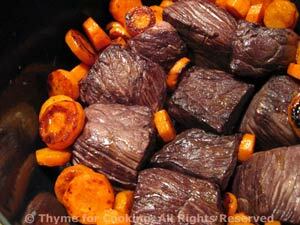 Cut beef into bite-size pieces. 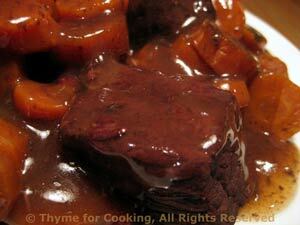 Add beef, leftover carrots and sauce to mushroom mixture, cover and simmer 5 - 10 minutes. To finish: Put drained pasta into a large bowl. Pour beef and vegetables over, stir well to combine and serve. It's the coffee that gives the name to this dish. I use instant as I always have some on hand for caffeine emergencies. Leftover from morning coffee works just fine - as long as it hasn't been on the burner all day ;-) I usually cut chicken breasts in half before cooking. Clean, trim and quarter mushrooms. When hot add paprika and sauté 1 minute. Add bacon or Prosciutto and sauté; 2 minutes for Prosciutto, 5 minute if using bacon. Add mushrooms and sauté 4 minutes longer. Move vegetables and bacon to the side and add chicken breasts. Sauté 2 minutes per side. Add coffee, stock and sugar, bring to a boil, reduce heat, cover and simmer 10 - 15 minutes or until chicken is done. 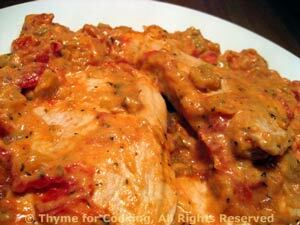 Remove chicken (put on a plate and cover with the lid from the pan) and increase heat. Add cornstarch dissolved in water and stir until sauce is thick.